Make trendy gluten free recipes a positive experience in your home with these 7 Gluten Free Recipes Your Kids Will Love. First of all, I would like to tell you that I am not gluten free, and I am not an expert on the subject. I do acknowledge that gluten free diets aren’t just a trend. I understand, and I know how important and life changing they are for certain people. What I do know is I cooking “grain-free” is delicious and brings variety to the table. Even though we eat gluten at home, I love gluten free recipes. They are usually very healthy and made with nutritious ingredients such as almond flour or coconut flours. For us, gluten-free cooking is not about restrictions. It is about more variety, different ingredients, and trying new flavors. Now, if you suffer from a gluten sensitivity or you follow a Paleo diet, these 7 Gluten Free Recipes Your Kids Will Love will be perfect to give you ideas. My kids love love love these recipes and we make them at home all the time. The great thing about these 7 Gluten Free Recipes Your Kids Will Love is you are going to get lots of fresh ingredients and nutritious vegetables! My 7 Gluten Free Recipes Your Kids Will love are all easy to make, take 30 minutes or less to prepare and contain no refined ingredients. No cans, no boxes, no refined sugars. And off course, no gluten. Real, fresh ingredients, some creativity, and lots of love for my family. 1. 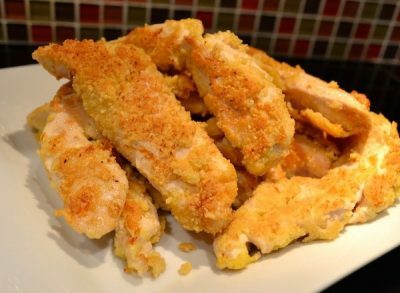 Healthy Homemade Chicken Tenders.- This recipe is so so delicious. Who doesn’t like chicken tenders? Made with only a few simple ingredients. Make sure you buy organic chicken, almond flour and pastured eggs. Enjoy the best and healthiest chicken tenders you could ever eat. RECIPE HERE. 2. 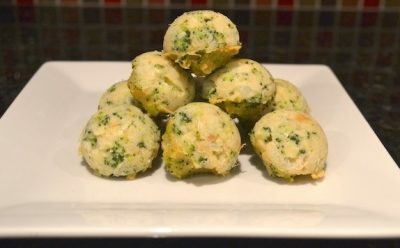 Broccoli Cauliflower Nuggets.- Great way to get your kids to eat more vegetables. At home we love our broccoli and cauliflower nuggets. It is one of our favorite recipes. These veggie nuggets are packed with vitamins and are absolutely delicious. RECIPE HERE. 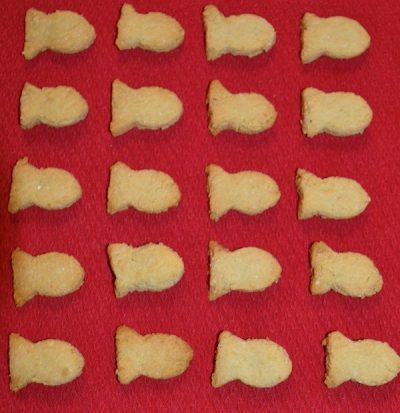 3.- Goldfish Crackers.- If you want to give your kids healthy snacks and avoid dangerous chemicals, GMOs and artificial flavors, then this recipe is just what you need. My son loves the crackers. Take them to the park, to school (if you don’t have a nut free policy), or just enjoy them at home. Made with only 2 ingredients and a little fish cutter . These crackers are amazing! Not only for kids but adults will love them too. RECIPE HERE. 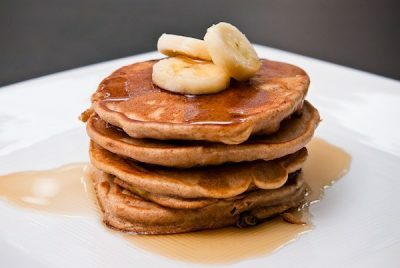 4.- Banana Pancakes.- All it takes is about 5-10 minutes and 2 healthy ingredients: bananas and pastured eggs. When I first saw this recipe and could not believe you can actually make pancakes with just bananas and eggs. No flours and no artificial ingredients or sugar. My kids love these pancakes! They are so easy to make, sweet and delicious and an excellent option for a healthy breakfast. RECIPE HERE. 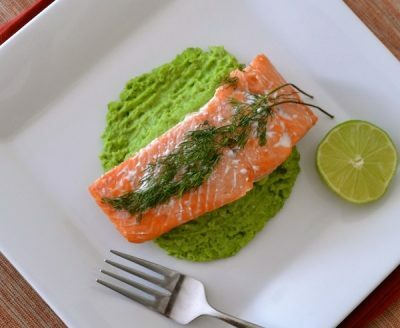 5.- Baked Salmon With Pea Puree.- This Baked Salmon With Pea Puree is a perfect way to serve the entire family a delicious dinner. Easy to make, nutritious and so enjoyable. Perfect meal ready in less than 30 minutes. Eating salmon will bring lots of health benefits to you and your family. – RECIPE HERE. 6. 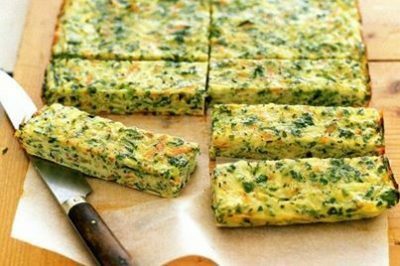 Zucchini And Carrot Bars.- I love baking with zucchini. Either way, warm or cold, these veggie bars are yummy and perfect for a quick healthy snack. They are also a perfect side dish or even an option for breakfast. RECIPE HERE. 7. 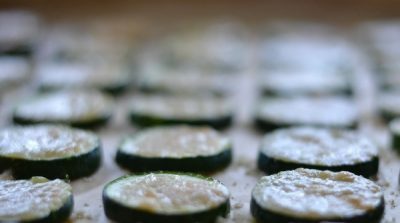 The Best Homemade Zucchini Parmesan Chips.- Here we go, zucchini again. But trust me. These are really the best homemade zucchini parmesan chips ever! Chips can be healthy and taste delicious if you get a little creative!RECIPE HERE.